Plans to combine new compulsory identity cards with passports and driving licences have been dropped by Home Secretary David Blunkett. The changes to the controversial scheme comes in response to MPs who said the plans were badly thought out. Mr Blunkett also promised to allow the whole scheme to be overseen by a new independent watchdog. The legislation to allow ID cards is widely expected to be promised in next month's Queen's Speech. The Home Office's official response to the Commons home affairs select committee inquiry into the project said: "When cost, implementation and risk considerations are assessed together, we now think the option of a free-standing card is more attractive." The new cards will include "biometric" details of each cardholder, such as their fingerprints, an electronic scan of the dimensions of their face or a scan of the iris of their eye. Approved agencies will be able to check those details against a central database. The government believes the cards will help combat illegal immigration and working, terrorism and identity fraud. Benefits to the public, the Home Office says, will include people not having to worry about using driving licences, passports or bank statements to prove their identity. If they are introduced they will be the first national ID since the Second World War ones ended more than 50 years ago. They will be phased in - people will get them at the same time as they renew or get a passport - and eventually be compulsory to have, though not to carry. The Home Office had originally planned to phase in ID cards from 2007-2008 by bringing in new passports which would include a microchip bearing biometric data and would double-up as ID cards. Instead, passport applicants from 2007-2008 will get a new biometric passport and a separate ID card. 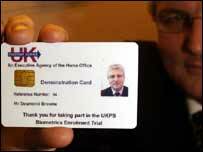 "The majority preference in research was that the ID card should be a separate document," a Home Office spokesman said. Creating a single organisation to implement the scheme would also improve accountability and possibly be cheaper, he added. John Denham, Labour chairman of the home affairs select committee, said the changes made it more likely the "essential scheme" would succeed, although further work on the details and costs was still needed. There would have to be careful scrutiny of the aims of the scheme, the new commissioner's powers and the safeguards against misuse of the system, said Mr Denham. "If we can get these areas of the Bill right, the ID card scheme can be placed on a sound legal footing," he added. Liberal Democrat home affairs spokesman Mark Oaten suggested the biometric technology to be used on the cards was not as foolproof as the government claimed. He argued the money would be better spent on more police and better intelligence efforts against terrorism. Mr Oaten said the costs of the scheme for the public were going up the whole time. But the Home Office said the prices remained unchanged: people would pay either £35 for a stand-alone ID card or £77 for a passport and ID card together. It was not true to suggest people would be charged twice for the biometric tests, said a spokesman. Conservative shadow home secretary David Davis said the Home Office should be able to introduce effective ID cards which curbed terrorism, serious crime and the "flood" of illegal immigration as well as being cost effective. He added: "If these criteria can be met without sacrificing civil liberties they should be introduced soon - not in 10 years time. The terrorist threat is real and is here today." Do you support ID cards?